the framework compositions are a series of experiments with untreated field recordings, exploring notions of musicality within the structures of found sound. the compositions were created with differing sets of self-imposed rules: framework 1 (whose sources were all recorded in paris, france in march/april 2003) was recorded, edited and composed entirely on a single minidisc with no overdubbing or alterations to the sounds or their relative levels; framework 4 (originally released on the soundwalk editions blog) is an experiment in sonic perception via the contrasts of resonance in different indoor and outdoor spaces; and frameworks 2 & 3 are both long-form works of multi-layered sonic environments originally commissioned as radio works (for the radia network and silenceradio, respectively). framework 3 also explores the use of voice as a musical tool within a larger public soundscape, and includes sounds produced by a group of workshop participants in an attempt to actively resonate and interact with a specific space, both of which call into question a recordist’s position as passive spectator. as an artist working with field recording who considers himself a musician, these works were in some way a reaction against this idea of documentary or objective presentation of found sound. if every microphone is a frame, can the works born via their vibrations be disconnected from a recordist’s perspective, decision, action, or emotion? these works could be said to represent a momentary perception of a place and time, or perhaps a conglomeration of overlapping memories and impressions of past moments, activities, and spaces. all sounds found between 2003 and 2011.
vocal performance on framework 3 [swarm] improvised on a café terrace in the south of france by mari kalkun and piibe kolka. sleeve design by lewisdoesdesign.com, with images by patrick mcginley. Patrick McGinley, also known as Murmer, has built since the mid 90s a body work of that deals with field recordings and electronics – in that order. Some of these works are based on pure field recordings, and these are gathered on ‘Framework 1-4’, a double disc with a good solid two hours of his work. Pure field recordings however doesn’t mean that we have four long pieces of one sound event that goes on for an infinite amount of time. In some cases, for instance in ‘Framework 2’ and ‘Framework 3’ various events are layered so there is indeed a composition of some kind and in ‘Framework 1’ various events are placed in short fragments, one after another. We have the four pieces that make up ‘Framework’ as well as four interludes, the most recent of the four main pieces. Pure sound scaping is perhaps not really my kind of music, I was thinking recently, and perhaps I like some ‘adjustment’ taking place, some interference or perhaps better: some kind of composition. 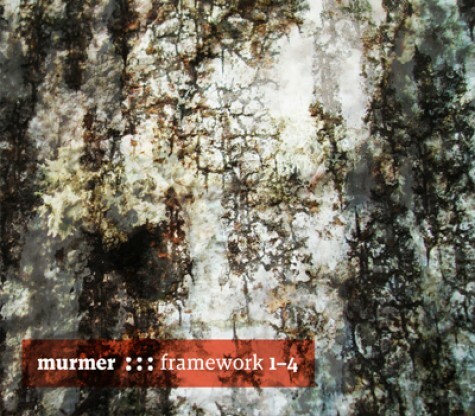 It’s perhaps as such that I like this Murmer quite a lot. It’s not overtly composed in the strict sense of composing, but there have been adjustments. Especially when McGinley is layering various sound events together, such as in ‘Framework 3 [Swarm]’. Then these sound events become music in my ears, they start singing, buzzing, and occasionally making a jump move and change the scenery. I prefer that over the more straight forward documenting of single sound events. A very fine work here, maybe a bit long altogether. Patrick McGinley (aka Murmer) is a sound artist whose primary tools are field recordings and found objects activated within acoustically interesting spaces. While most of his impressive back catalogue of recordings finds him manipulating and treating those sounds into expressive drones and subtly dynamic collages, this double disc set is far more spacious and open-ended, given a slight shift in methodology. He explains in the liner notes that “the framework compositions are a series of experiments with untreated field recordings, exploring notions of musicality within the structures of found sound. The compositions were created with differing sets of self-imposed rules.” Two of the four compositions deal specifically with voice, with “Framework 3” settling into a rather lovely passage of wordless vocal harmonics improvised in an open terrace by noted Estonian folk singers Mari Kalkun and Piibe Kolka. This track begins with a reprise of some of the sounds that McGinley used on his 2012 album What Are The Roots That Clutch, as heard in the dense burbling of water insects, building up through brightly resonant objects that shimmer with the minimalist fervor of an Angus MacLise composition. “Framework 2” is the other piece dealing with voice, with the grunts and wheezes of somebody snoring very loudly at the end of this 30 minute piece, which is mostly comprised of frigid wind-blown recordings and scabrous snippets of activity more on par with G*Park’s ice-born recordings. “Framework 4” alternates between interior and exterior sounds emphasizing the psychological impacts of the incessant buzz of late-summer cicadas and the flourescent-tube hum of institutional space. Beautiful wanderings of sound that always have the potential to surprise, frighten, and delight.